LaCouture2066.jpg Christian LaCouture of Louisiana State University celebrates after making a big play during the 2014 season. 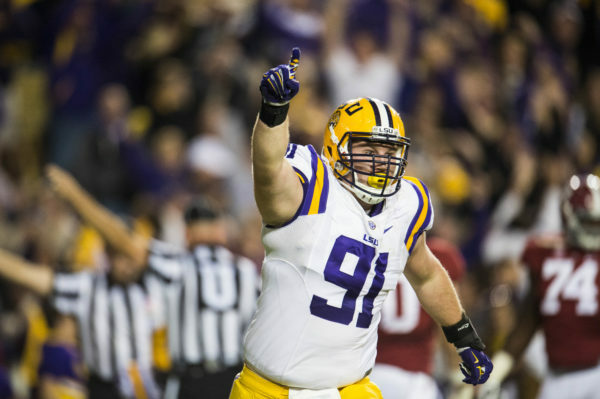 The senior defensive lineman, the son of former University of Maine hockey player Dave LaCouture and Orrington native Amy (Henderson) LaCouture, recently was honored as the Tigers player who will wear their coveted No. 18 jersey next season. 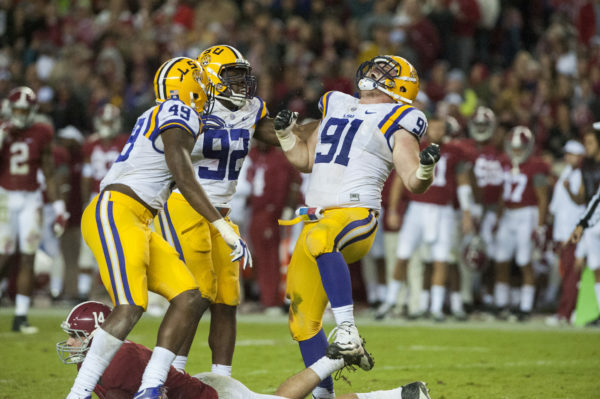 Christian LaCouture (91) of Louisiana State University celebrates with teammates after making a tack during a game in 2015. 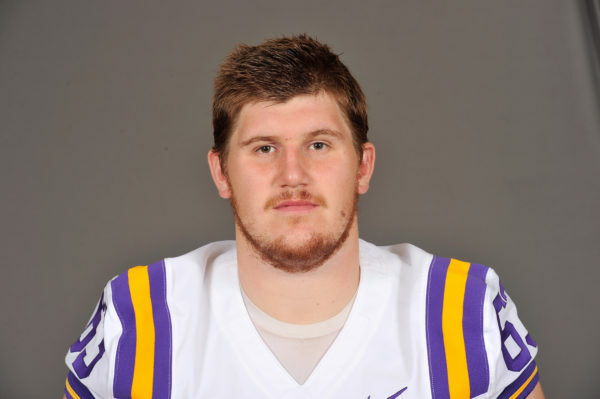 The senior defensive lineman, the son of former University of Maine hockey player Dave LaCouture and Orrington native Amy (Henderson) LaCouture, recently was honored as the Tigers player who will wear their coveted No. 18 jersey next season. His father was a valuable role player on the 1992-1993 NCAA hockey championship team at the University of Maine. Dave LaCouture was one of the senior leaders on that 42-1-2 team and now his son, Christian, has been rewarded for his leadership at Louisiana State University. Christian LaCouture has earned the prestigious No. 18 jersey for the 2017 football season. The jersey symbolizes integrity, resilience, character, selflessness and leadership. It is given to the player who typifies how an LSU football player should conduct himself on and off the field. “It is such a prestigious honor and now it is up to me to live up to the expectations and not let the team down. But I love pressure. I want to be a great leader,” said Christian LaCouture. According to the LSU athletics website, the No. 18 tradition was born in 2003 when quarterback Matt Mauck led the Tigers to their first football national title since 1958. No. 18 became synonymous with success, on and off the field, as well as a selfless attitude that has become the epitome of being an LSU football player. After his final season at LSU, Mauck passed the jersey down to Jacob Hester, who led the Tigers to another national title in 2007. 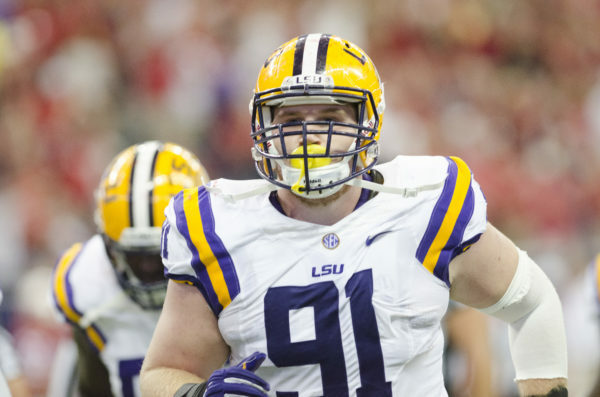 LaCouture is a two-year starter on the defensive line. He was a medical redshirt last season after tearing the anterior cruciate ligament in his right knee last August. Only four days after sustaining the injury, the LaCouture house in Baton Rouge was flooded after several days of heavy rain. That forced David, wife Amy (Henderson), Christian and daughter Taylor to spend several days living in cramped quarters on the second floor. A frustrated Christian couldn’t help out because of his knee. Adding insult to injury was the fact his parents were told they weren’t in a flood zone so they hadn’t purchased flood insurance. “It cost my family around $200,000,” said Christian. His father said they are proud of him and of his receiving the No. 18 jersey. “It is quite an honor for him,” said David. Christian LaCouture, who stands 6-foot-5 and weighs 301 pounds, grew up playing hockey and football. He attended elementary school in Camden before studying at Center Drive School for grades 4-7 in his mother’s hometown of Orrington. The family spent three years at Permian High School in Odessa, Texas, before Christian played his senior year at Southwest High School in Lincoln, Nebraska. He appeared in all 13 games and had 11 tackles as a freshman at LSU. He started all 13 games his sophomore year with 40 tackles. Two years ago, he was in on 35 tackles and forced a fumble. The former high school All-American, who had surgery the week after the flood, is involved in spring football right now but is taking it easy as he continues his recovery. LaCouture has already earned a degree in sports administration and is working toward a master’s degree. He has a special place in his heart for the program since his dad played on such a memorable team and has shared with him a number of stories about his time at UMaine. “I’m always asking my dad for advice,” said Christian, who still has a lot of family members and friends in Maine and always enjoys returning. He hopes to get the opportunity to play in the National Football League and would love nothing better than to win a national championship this fall.